The GottaBe! got buzzing for charity! On Sunday the 23rd March, the team got all dressed up to take part in the Sport Relief 2014 charity fun run. 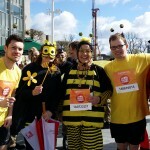 The Managing Director Tomasz Dyl after persuasion from the Mayoress of Southampton; Marie White encouraged the team to dress as bee’s along with hundreds of other participants. The team managed to raise over £200 for the Sport Relief charity; the money raised will help support a number of individuals across the UK and further. After the event all the team mentioned the support they received from the supporters along the route. – It’s moments like this that make you proud to take part in events across the city – mentioned Tomasz Dyl. The team at GottaBe!are now looking at taking part in future events across the city. The support from Southampton has helped the brand expand so it really time to take part in a number of events to give back to the community. Nothing Feels Better Than Helping Charity!